Bad Santa…. Couldn’t resist reposting this splendid image of Mr. Shopkeeper. The concept of feasting was pretty much invented in the Middle East by the courts of Shah Abbas and those opulent Ottoman dudes. If you combine this fact with the idea of meze – the relaxed sharing of multiple dishes, and also our speciality – celebrating your vegetarian Christmas with us is a bit of a no-brainer. 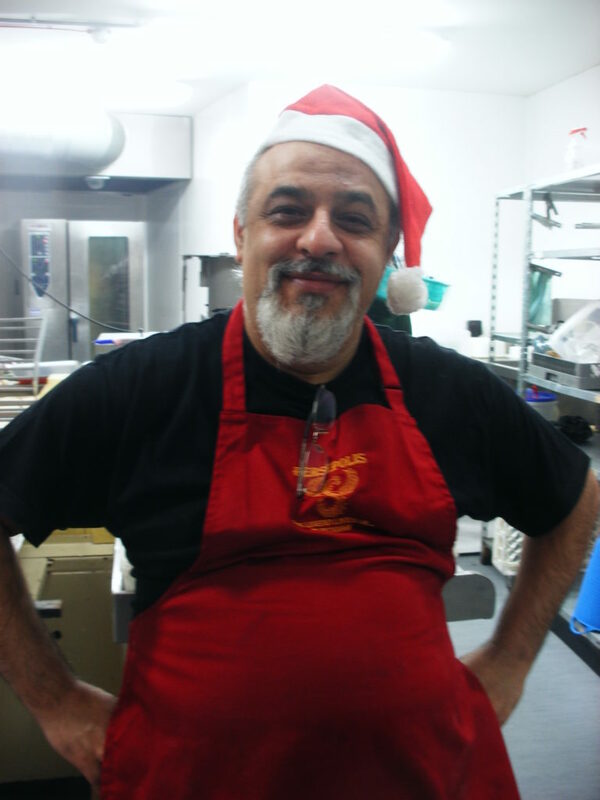 The price for our festive menu is £30 a head, and includes Christmas fripperies, cheesy Christmas music, a complimentary glass of Persepolitan Pimped Prosecco on arrival and Mr. Shopkeeper’s best Santa impression. A £10 a head deposit will secure your reservation. We are already taking bookings, and we only have ten tables, so book sooner rather than later. A typical menu will look something like the one below – but please note that Mrs. Shopkeeper is nothing if not spontaneous, and the menu sometimes changes hourly, let alone daily. NB: We will happily consider other catering enquiries and private parties. What is the date/s for your Christmas party.thank you Stuart.